Bike SA delivers quality services and has achieved excellent outcomes across a broad range of council objectives including those relating to health and well being, community development, environment and community spaces, traffic management/congestion, and green active transport. Download a summary of services outlining objectives and target audiences. Please get in contact with Sam Drummond of Bike SA to discuss any of these services, our current projects and the opportunity to consider innovative ways to meet the needs of your community. 'Be Safe Be Seen' Workplace Bicycle Education Program. FREE 30 minute Cycling Safety Presentation. Courses are limited to 10 people and sell out quickly so book today! CycleSafe Essentials is an exciting 2.5 hour course aimed at encouraging and supporting adults into commuter and recreational cycling. It seeks to find solutions to common barriers that often stop people from considering cycling like a lack of skills and confidence to negotiate traffic, safer routes, rules and awareness. What makes these sessions easy to attend is that all bikes and helmets are provided, the groups are small (up to 5 people), convenient short time frames, and Bike SA can deliver training at a location that suits the community or organisation that books it. Basic bike handling (off road) instruction - improving balance and control skills, emergency braking, scanning etc. 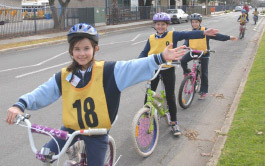 The program aims at encouraging existing new arrival community networks to learn good riding and control skills, develop the appropriate skills required to negotiate common traffic situations and familiarise themselves with the Australian road environment and rules. CycleSafe New Arrivals Program is an exciting collaborative effort between Bike SA and the Australian Refugee Association (ARA) and the Bicycle institute of South Australia (BISA). 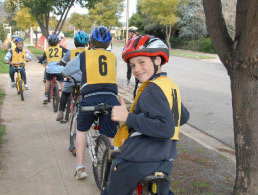 Fun practical bike education programs for children during school holiday breaks. Encourages safer cycling, improves awareness and skills. Often run through communities centres and schools. Provides healthy and active school holiday services to community. Children from R-7. 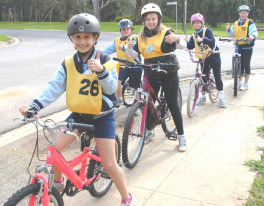 Way2Go Bike Ed is a national road safety initiative that encourages personal cycling safety, and the development of responsible behaviours when travelling and participation in physical activity for student ages 9-13 (years 4-7). Through a considered decision making process in a practical learning environment, participants are given the opportunity to develop awareness of road safety and the consequences of their behaviour. Students are prepared for on road cycling and learn the skills and attitudes required for safe cycling in low to medium traffic environments. Provides training for people/organisations interested in ride leading and training. Expands the reach of cycling support services. All ages. Join or Renew your Bicycle SA membership online!